So far, I am really impressed by all the improvements in VMM 2012 when it comes to the deep integrations with hardware resources, hypervisors, and clusters. The possibility to administer and manage the entire eco system from a single console, is a huge benefit in our day-to-day work. Another interesting improvement is how you can create logical and virtual networks. 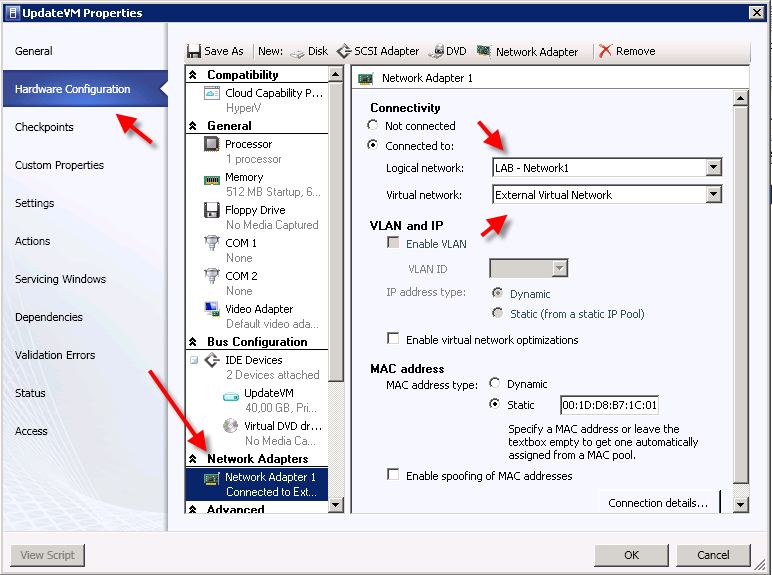 In my last post, I covered the creation process of a Failover Cluster with VMM 2012 so now we will now focus on the creation of both logical and virtual networks. After the hosts are deployed and configured in VMM 2012, the cluster is created, you need to prepare another resource in the Fabric. – Networking. 2. Create a definition – name of the logical network, and select the host groups which it should apply. 4. Create IP Pool Name and Address Range. These steps look familiar to a DHCP server configuration with some extra options. You can specify one or more IPs from the IP subnet to be used for creating VIPs or that are reserved for other purpose. You also define default gateway, DNS servers and suffixes, and eventually WINS servers. We have now configured a logical network, and made it available in the Fabric. The next steps are to assign these logical networks to our cluster, and create an External Virtual Network. We will have to repeat these steps for every server. 2. 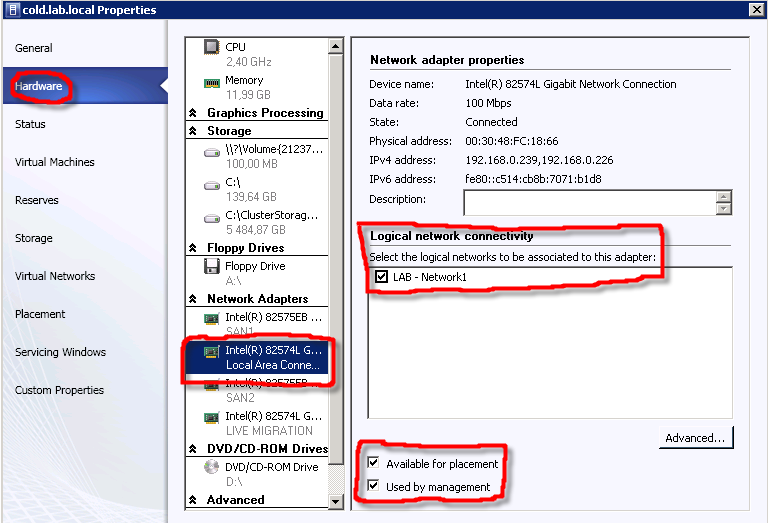 Select the ‘Hardware’ tab, and find the physical NIC that is actually connected to this logical network. I am using my management NIC in this example. 3. 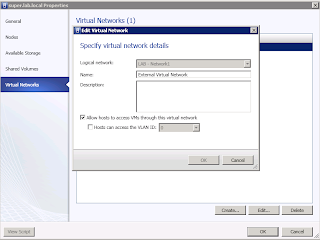 Move on to the ‘Virtual Networks’ tab, and Add a new virtual network. 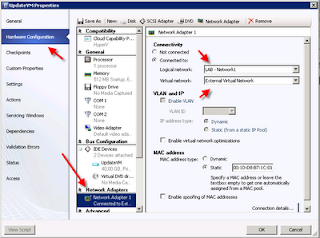 Make this an External network, and select the dedicated NIC for this network. 1. Navigate to your cluster in the Fabric. Right click, and select properties. 2. 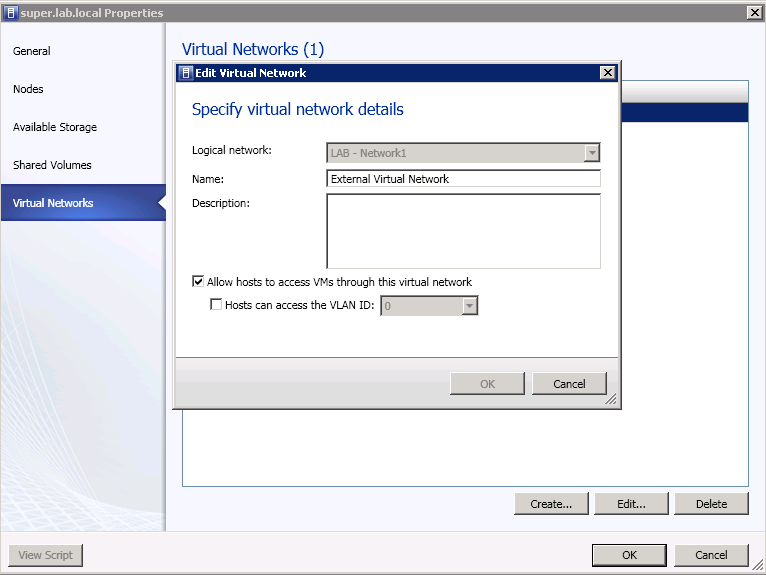 Go to the ‘Virtual Networks’ tab, and create. 3. 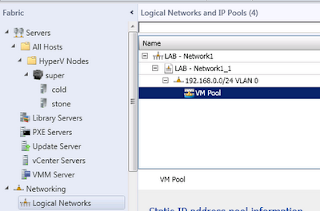 Select your Logical network in the drop down list, and name your Virtual Network. 4. 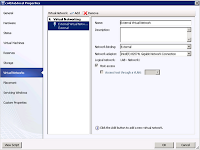 Select ‘Allow hosts to access VMs through this virtual network if you want to share the connection. Your cluster is now ready to deploy VMs as far as networking concern. 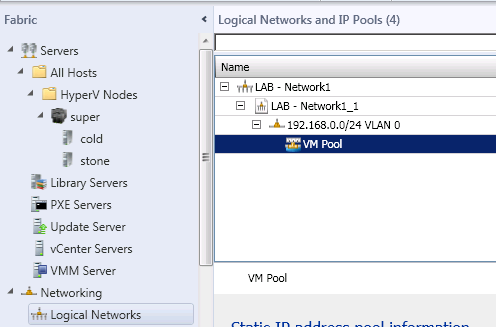 You can now connect your VMs to your logical and virtual networks, and assign IP configuration from the pool you created in this guide.